Are Crawlers Less Creepy Than You Thought? Celebrate! The birds are singing, the flowers are blooming - and the creepy crawlies are back! Okay, maybe the proliferation of spider webs and daddy long legs doesn’t exactly have you jumping for joy, and instead just to get that darn thing off of you, but the reappearance of our eight-legged companions is a vital moment in the health of the Arb ecosystem. Not only do many birds and other animals rely on juicy spiders as a food source, but spiders and daddy long legs - actually vegetarian cousins of spiders more closely related to scorpions - are voracious eaters that make a big impact. While daddy-long-legs, known as Opiliones or Harvestmen, eat detritus off the forest floor, spiders keep insect populations in check, including mosquitoes, flies and even some agricultural pests. Others specialize in eating ants, disguising themselves with pheromones so they smell like an ant. Some, such as the charismatic jumping spiders, eat insects living on the forest floor by using fantastic eyesight to track down their prey, while some construct and throw nets of silk. 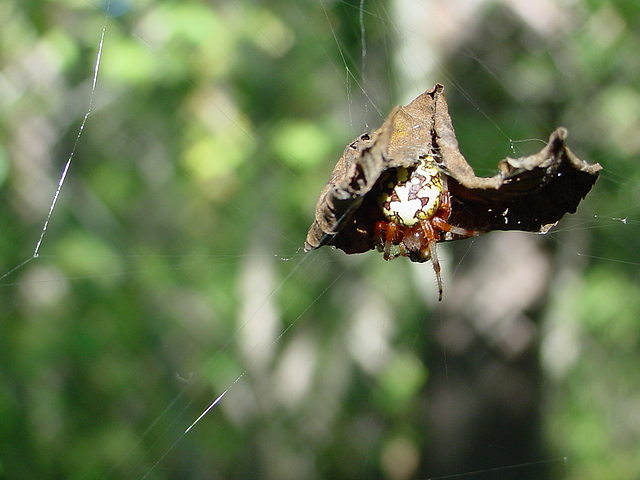 Still others construct ornate webs with elaborate designs and multiple types of silk. If you peek in a flower in bloom, you might even witness a crab spider disguised in the petals and nabbing visiting pollinators. In addition to being predators, these spiders might be important to pollinating some plants, and even protecting them from invaders. However you feel about spiders, daddy-long-legs, or their abundance of legs, you can’t deny that they are pretty cool - and they help keep the flowers blooming, the forest active, and the birds singing. Maybe you can develop a soft spot for them, after all. Speaking of birds; don’t forget to join us for our Annual Bird Count this Saturday at 6am! We will meet in the Arb Office before venturing into the Arb to count as many birds as possible. No experience venturing or birding is necessary.